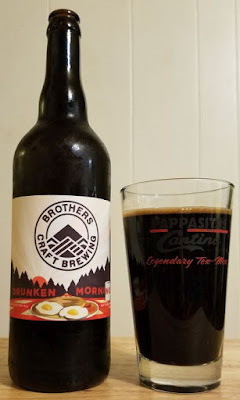 Six beer reviews, with an emphasis on Brothers Craft Brewing and their collaborators. Citra Spective Sour IPA is a collaboration between Brothers and NoDA. It is pale, slightly cloudy yellow with a thin head. The aroma is lemons, tangerine, some vegetable notes. I like the flavor, it is strongly sour mid-tongue but there is a little malt character on the finish that reminds me of popcorn. Good beer. Brothers worked with Ocelot to make Us And Them, an IPA. I’d look for a reason to give this beer a positive review just because of the Pink Floyd themed name and label. Thankfully, I didn’t have to look far. This is a dry, tight IPA that hits the right notes. It pours cloudy yellow with a gigantic head. The aroma is grapefruit, pine resin, garlic. The flavor is mellow at first but closes with a bitter kick. Overall, well balance and tasty. Night Cap is a porter brewed by Brothers and Crooked Run. This beer pours dark brown with average suds. The aroma is subtle, malty, and slightly sweet. Some dark bread, a little bit of cherry. I like that the cherry doesn’t dominate the flavor, it’s there on the finish and not an overplayed card. This is pretty good. Of the four beers in this set so far, this one is definitely the winner. (Spoiler alert: it's also the best thing in this whole set of six.) Coconut Shy is a Brothers stout with coconut, and it's really good. It pours black with tan/orange foam and highlights. The aroma is great. The coconut is strong but it isn’t too much. It blends with the malty, chocolaty stout very well. The flavor is a little bit like drinking a Mounds bar. Coconut and dark chocolate and a little coffee. When it comes to sweet stouts, it seems like I either don't like them at all or like them a whole lot. I like this a whole lot. Brothers Drunken Mornings is an imperial stout. It isn’t bad, but it's really hot. This stout pours dark brown to black with little foam. The aroma is oak barrel in a big, unmistakable quality. The flavor is boozy. Boozy may be understating it. I’ve had booze that wasn’t this boozy. It’s good, don’t get me wrong. Obviously a lot of work went into this thing, and the craft shows. But at more than 12% ABV, it might not hurt to let this one mellow for a fair bit. Soft Serv is an imperial porter from South Street. It pours chocolate brown with average head. The aroma is rich porter malt character, and some chocolate, but I pick up on more of other notes, like vanilla and some caramel and coffee. The flavor is the same as the aroma, but more so. It’s fairly big and aggressive, and not as overly sweet as I’d worried that it might be.